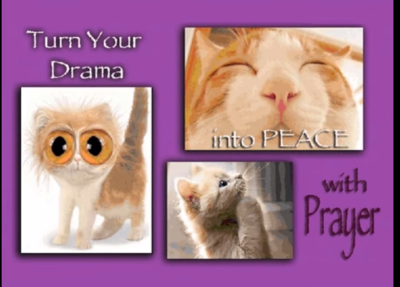 Is your life a constant drama? Or fragmented by cycles of drama? I have realized at times that my life has been drawn into some kind of 'drama' and one thing after another, like furious waves crashing down all around me make it impossible to find peace, rest, security. How often the enemy uses others to accomplish that. I remember living in Phoenix as a single mother of four children, always counting on the providence of God to sustain me. But I noticed a pattern: if I was sick or weak from the feminine cycle, that would be exactly the week that everything would hit me as if projected out of a high powered fan. I began to see that the enemy used my weak cycles and moments, times when I was most vulnerable and at my lowest, to harass me with more than one threat, so as to overwhelm me. So often they involved other people, even well-meaning church people. The plumbing would back up, the landlord would threaten us, our rent would be late, the car would vapor lock, the children would catch a cold. Altogether, it was sometimes so overwhelming that I almost fell into despair, I just couldn't handle it all at once. But the Lord soon began to teach me, it's not about you, it's about Me. You are My servant and they, the demons, want to incapacitate you so that you will give up, back down, throw your hands up in defeat. That is their favorite goal, but at the very least: STEAL YOUR PEACE. You see, when the enemy accomplishes turmoil, distractions ensue, your mind is turned into a turbulent ocean, a place of danger rather than security. If you are serving Him and the turbulence continues, you become ineffective, all wrapped up in yourself, unable to cope outside of your circle of problems. Along come other people who are looking for peace and instead of being Jesus' ambassador of peace and healing, you pass on your turbulence to the next person, they pass it on down the line, and the world continues to revolve around chaos. "God's promise of entering His rest still stands, so we ought to tremble with fear that some of you might fail to experience it." And indeed fear is the very thing that sets in when peace is lacking. people to enter, but those who first heard this good news failed to enter because they disobeyed God. 7 So God set another time for entering his rest, and that time is today. God announced this through David much later in the words already quoted: "Today when you hear his voice, don't harden your hearts. "8 Now if Joshua had succeeded in giving them this rest, God would not have spoken about another day of rest still to come.9 So there is a special rest still waiting for the people of God. 10 For all who have entered into God's rest have rested from their labors, just as God did after creating the world. 11 So let us do our best to enter that rest. But if we disobey God, as the people of Israel did, we will fall." Yes, we will fall, and fall and fall - again, and again, and our lives will resemble a turbulent merry-go-round of stressors, emergencies, high tension, impossible situations, and we will be in a constant state of agitation and unrest. We will pass on this drama to others because our space will be turbulent and anyone who comes in contact with us will walk away touched by turbulence, hopelessness, insecurity. Brothers and Sisters, we must get ahold of ourselves and see clearly once and for all WE ARE NOT GOD, and only God can resolve the things that are thrown at us. And the sooner we turn to Him and let it go, and encourage others to let it go, the sooner we get on our knees and pray for God's intervention, the sooner a resolution will come. BUT WE CAN'T MAKE IT HAPPEN. I see this so often in adults who were raised in or lived in abusive families. There is always a mediator or two, someone who is trying to restore order and calm and 'make it alright.' These people can be very controlling, not out of malice but because they are trying to make it right. But only God can truly make it right. Yes, blessed are the peacemakers, but it is the anointing of the Holy Spirit on a person, not their reactions to turbulent dramas every day that give them the power to be a peace maker. And how do you become a peacemaker? First you must be at peace with God. You must know deep down in your heart that He is the answer to every situation. This involves FAITH... YOU MUST BELIEVE in someone outside of yourself, you must believe in Him. Only then can you let it go and let God. You may be used to resolve the tension, you may not, but only your faith and relationship with Him can guide you into the right role. Stand back and let God...or give you a word to speak in season...make a phone call...or put it to rest at the foot of the Cross. How amazing that sometimes when we finally stop trying to be God and fix it, the answer comes and all is made calm again. He wants us to look to Him for answers and then after we have placed the problem in His hands, stand back and wait for direction. Encourage others involved not to call their friends or get busy on the phone, but to get busy on their knees and pray. That is where the power to resolve is, not in your hands, but in God's hands. How we love to be around joyful, peaceful people, how beautiful their presence - but notice, they don't have dramas...they only have prayers waiting to be answered. They have a deep, resplendent peace in Jesus that inspires others to turn to Him and be healed. They are carriers of the words of truth, the words of resolution, the world's answer to all dilemmas. The Scriptures teach this as well in the Book of John, chapter 14, entitled: Christ Is Our High Priest. 14 "Since we have a great High Priest who has entered heaven, Jesus the Son of God, let us hold firmly to what we believe. 15 This High Priest of ours understands our weaknesses, for he faced all of the same testings we do, yet he did not sin. 16 So let us come boldly to the throne of our gracious God. There we will receive his mercy, and we will find grace to help us when we need it most." Let us leave off with responding to the button-pushing demons, let them cause turmoil to themselves. Let us calmly turn to God and watch Him accomplish what none of us thought possible. Have faith people! Not faith in what you can do.... Faith in what GOD WILL DO, because you prayed and are waiting for Him to do it.